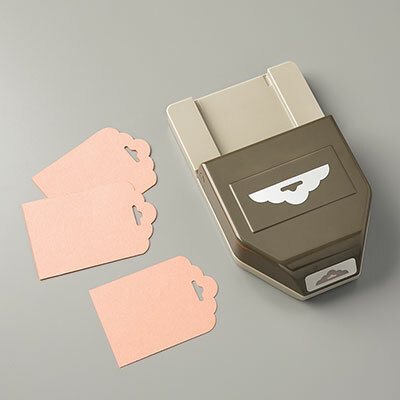 Rubber Room Ramblings: SCALLOPED TAG TOPPER PUNCH RULES! I am amazed at the versatility of this punch! Check out this card made with the Scalloped Tag Topper Punch. This is the card "That Michelle" shared with us at our Demo Diva Night this month. I had no idea you would be able to use the Scalloped Tag Topper Punch to make this unique card closure. Of course, the Watercolor Designer Series Paper adds so much softness and beauty to this creation. The sentiment comes from the Label Love Stamp Set and it is punched out with the coordinating Artisan Label Punch, which is on sale this week. All these wonderful tools make this a very quick and easy card to make, and I will definitely be sharing it in my upcoming classes. Thanks for sharing with us, Michelle. ORDER WHATEVER YOU NEED TO MAKE THIS CARD HERE!